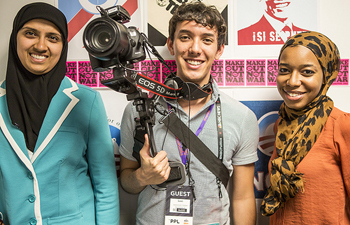 At the Democratic National Convention, a nearby independent media center was set up in Uptown Charlotte called The PPL that attracted a diverse group of media makers. All photos by Kris Krug. With convention delegates and the media armed with iPhones and using Instagram, Twitter, YouTube and Facebook, this election is more connected and real-time than any that has come before." At the Democratic National Convention taking place in Charlotte this week, there’s a huge focus on independent media, especially blogging and citizen journalism. 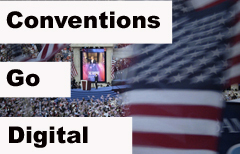 With convention delegates and the media armed with iPhones and using Instagram, Twitter, YouTube and Facebook, this election is more connected and real-time than any that has come before. One particularly interesting project is an independent media center called The PPL. The PPL is a coworking and event space in Uptown Charlotte just blocks from the main events designed for emerging and online media covering the DNC. In addition to a newsroom supporting hundreds of independent journalists, activists, and non-profits, The PPL has been hosting parties, guest speakers, and roundtable discussions throughout the convention. Below is a slideshow of some of the movers, shakers and happenings from the independent media scene at the DNC — along with one great shot from the stage when President Obama hugged former President Clinton. To display captions for the images, expand the slideshow to full screen and click on “options” in the right corner. Kris Krüg is a designer, writer, photographer, and webmonkey based in Vancouver, British Columbia, Canada. Constantly challenging himself by shooting diverse subjects from emerging rock bands to dot-com execs, Kris uses his engaging personality to break down the barriers between lens and subject. Kris is a fervent evangelist for open culture and Creative Commons licensing and frequently speaks at conferences and the media about the blurring lines between pro and amateur, shifting copyright standards and using technology to promote and share artistic work. Kris realizes art isn’t created in a vacuum and a vibrant community is key for culture to flourish. With this in mind, he organizes photowalks and workshops for newbies and veterans alike to encourage knowledge sharing and collaboration.